Wilson delivered one of the best performances you will see from a quarterback all year. Completing 14 of his 17 pass attempts for 248 yards, Wilson threw three touchdowns and no interceptions. Even when the Lions were able to put him under pressure, Wilson still went 5-for-7 for 82 yards. He finished the game having completed all nine of his pass attempts targeted at least 10 yards beyond the line of scrimmage, including going 3-for-3 for 96 yards and a touchdown on throws 20-plus yards downfield. Wilson wasn’t the only player on the Seahawks offense to impress, as Carson went over 100-yard mark against the Lions. Five of his 25 carries resulted in a first down or touchdown, and he forced six missed tackles as well. Adams was targeted twice by Aaron Rodgers on throws 20-plus yards downfield, catching both for 89 yards. On the field for just 25 passing plays, his 133 yards gave him a 5.32 yards per route run average, the highest of any receiver in the NFL to see at least 20 receiving snaps. Dominating out of the slot, Boyd caught 9-of-10 targets for 138 yards and a touchdown. No other receiver has produced more than 75 yards from the slot this week, giving an indication of just how impressive Boyd was. As good as he was though, the day could have been even better, were it not for a drop denying him his 10th catch of the day. On throws to Doyle, Colts QB Andrew Luck produced a passer rating of 147.9 in their win over the Raiders on Sunday. Doyle caught six passes for 70 yards, with five of those receptions resulting in a touchdown or first down, tied for the most among tight ends this week. When the Bengals needed Green the most, he was there. Driving for the game-winning field goal, Green caught two of his five receptions, for 34 of his 76 receiving yards on the game’s final drive. Earlier in the game, he added an impressive touchdown grab and finished the game with Andy Dalton having produced a 146.4 passer rating on throws where he was the target. Peters missed some time during the game but his ability to return and perform at a high level was key for the Eagles. Solid as a run blocker, it was in pass protection where he really made his mark, allowing zero sacks, hits or hurries from 25 pass-blocking snaps, good for a 100.0 pass-blocking efficiency rating. 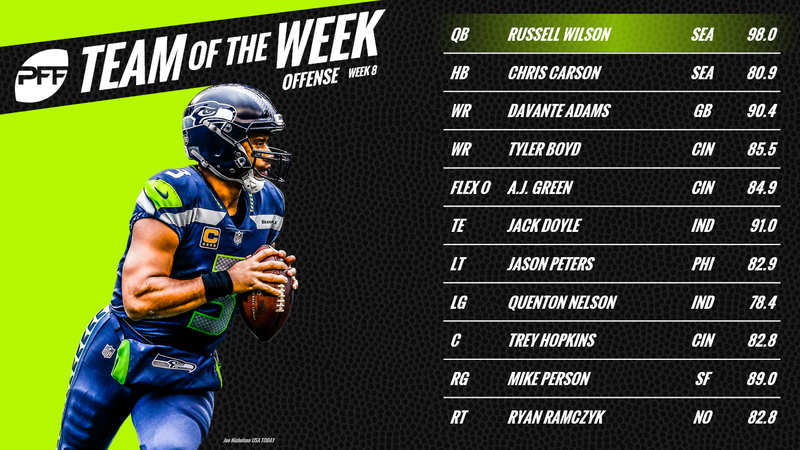 Nelson has had his ups and downs in his rookie season, but through eight weeks of the year, this marks his second appearance in the PFF Team of the Week. Like Peters, he didn’t allow a single sack, hit or hurry on the day, playing 35 pass-blocking snaps. Producing the highest-graded game of his season so far, Hopkins (there’s a theme here) didn’t allow any pressure from 41 pass-blocking snaps. After failing to produce a PFF run-blocking grade of 60.0 or higher through the first seven weeks of the season, he delivered an 80.6 run-blocking grade this week. While it was another day to forget for the 49ers, Person produced his best game of the season, shutting out pass-rushers and allowing zero sacks, hits or hurries from 35 pass-blocking snaps. That marks the fourth time this season that he hasn’t allowed a single pressure in a game. Ramczyk has made a strong case for being the best right tackle in football in 2018, and Sunday Night Football was yet another example of that. From 24 pass-blocking snaps, he too produced a perfect 100.0 pass-blocking efficiency rating and was once again impressive as a run blocker. Ford was outstanding once again for the Chiefs on Sunday, racking up eight total pressures from 33 pass-rushing snaps. Three of those pressures were sacks, and he added two forced fumbles too. For the season, he has now racked up 45 total pressures, including nine sacks. It really feels like we should probably just save our Team of the Week template with Donald on the team given how he’s currently performing. In the win over the Packers, he brought down two sacks, two hits and three hurries from 31 pass-rushing snaps, and added a defensive stop against the run. The front-runner for Defensive Player of the Year again, his dominance shows no signs of slowing down. New team, same Snacks. Harrison finished his Detroit debut with six tackles resulting in a defensive stop, the most of any player on the defensive interior this week. While he is renowned for his work against the run, he also added a sack on Sunday. Flowers was impressive as a pass-rusher, racking up two hits, a hurry and a batted pass from 33 pass-rushing snaps but he was just as devastating against the run. From 19 snaps in run defense, he registered five tackles, all of which resulted in a defensive stop, the third most of any edge defender in the NFL this week. Leonard has been getting lots of hype this season but Sunday’s win over the Raiders marked his best performance of the year. Five of his eight tackles on the day resulted in a defensive stop, and despite allowing three receptions in coverage, allowed just a combined 23 yards. Milano played well for the Bills on Monday, and it wasn’t for the first time this season. Tom Brady went after him five times in coverage but Milano yielded just two receptions for 14 yards and finished the game with two pass breakups to go along with his four tackles resulting in a defensive stop. From 40 snaps in coverage on Sunday, Harris allowed just one reception for six yards, but his impact wasn’t just limited to covering the receiver he was assigned to. He finished the game having registered four tackles, with all four resulting in a defensive stop. Gilmore was targeted seven times on Monday Night Football, allowing just two receptions. One of those did go for 40 yards, but the other for just five. 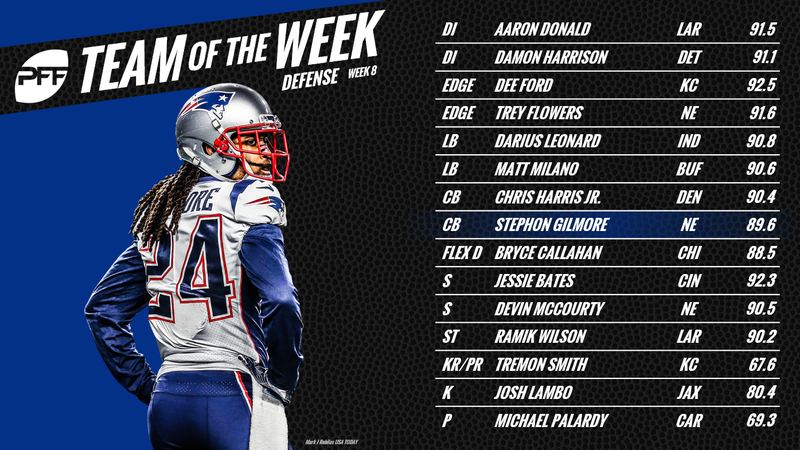 Gilmore also had two pass breakups and finished the game having allowed a passer rating of just 53.9 on throws into his coverage. For the second time this season, Bates produced the elite level of performance that saw the Bengals name his a starter heading into the season. He was the primary defender in coverage on seven throws on Sunday, but allowed just two receptions for 14 yards, and came away with an interception and pass breakup. McCourty had already enjoyed a solid night but his pick-six sealed the game midway through the fourth quarter, pushing him into our Team of the Week. Over the course of the game, he was targeted just twice, allowing two catches for 18 yards to go along with his huge interception. Callahan was targeted six times in coverage in the Bears win over the Jets but allowed just two receptions for 23 yards. Even better, of the six incompletions on throws into his coverage, three were the result of pass breakups by Callahan. By the end of the day, he had allowed a passer rating of just 45.8 on targeted throws. Making some big-time kicks across the pond, Lambo connected on all four of his field goal attempts, including two from beyond 50 yards in the Jaguars loss to the Eagles at Wembley Stadium in London. This is not the first time this season we’ve seen Palardy earn the spot as our punter in the Team of the Week as he once again delivered. Two of his three punts landed inside the Ravens 20-yard line, and he averaged 4.54 second of hang time per punt. We haven’t seen many big returns yet this week, but Smith delivered some consistency for the Chiefs yesterday, averaging 27.3 yards per return from three kick returns in the win over the Broncos. Wilson saw 21 special teams snaps in the win over the Packers, splitting time across the kick return, kick coverage, punt return and punt coverage units. He registered two tackles on the day and forced the key fumble to give the Rams the ball back after taking the lead late in the game.